Features: The greatest final ever? 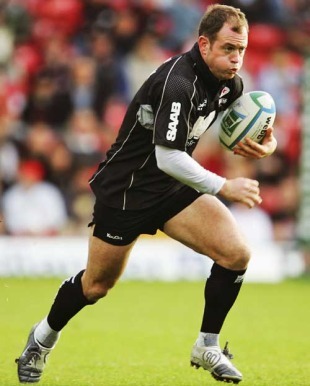 Former Saracens scrum-half Kyran Bracken has backed his old club to beat Leicester in Saturday's Guinness Premiership Final - but is hoping at least one of the Tigers has a great game. Bracken, who spent 10 years at Vicarage Road between 1996 and 2006, is confident they can deliver at Twickenham despite being denied the services of director of rugby Brendan Venter, who is serving a touchline ban for making provocative gestures towards spectators during his side's clash with Leicester earlier this month. But the Rugby World Cup winner, capped 51 times by England, is also hoping that Leicester scrum-half Ben Youngs continues his rich vein of form having coached the rising star in the latter stages of the season. "Saracens have taken a fair bit of flack this season," the 38-year-old told ESPNscrum. "Some of it fair and some quite unfair. And I don't really see the point of preventing the coach being there as a punishment, to me that is a bit strange. You want to see the two teams and coaches going against each other and for it to be a case of the best team wins. "I think it will be a shame that he is not there, and there may be tactical repercussions but if anything it may spur them on. I think the coaching team are very savvy and they have got a great on-field leader in Steve Borthwick. I still think that Leicester are the team to beat but I just think there is something about Saracens this year, that never say die attitude and the fact they were able to totally change the way they played. It certainly has got the hallmarks of a great occasion. "I have no doubt that they can do it, but the question is whether they will do it. Psychologically they may have an advantage having beaten them at Welford Road not too long ago. One of the big things about finals is belief and Leicester have previously had this knack of winning, but the question is whether the current crop of Leicester players have the same belief as the Saracens players - just maybe Saracens have the edge there. "Then there is the pressure of the occasion, finals are often won on tiny things, the ball bouncing a different way. I certainly think it really could go either way and am crossing my fingers the Saracens win but at the same time would like Ben Youngs to have a good game." Bracken linked up with the Tigers a few months ago following an approach from Leicester's head of operations Simon Cohen and has since had "just a few" sessions with the 20-year-old who has won both the Premiership's Discovery of the Year award and the RPA's Young Player of the Year honour in recent weeks. "They are always trying to get an edge over everyone else," revealed Bracken of his tie up with the Tigers. "He's certainly a very talented guy and his feet have probably not touched the ground in the last couple of weeks. I'm not sure he expected to get into the Leicester side ahead of Harry Ellis, have a great season, player of the year, all sorts of other awards and get capped for his country and be picked for the summer tour." Youngs faces probably the biggest test of his career on Saturday against Saracens' South African scrum-half Neil de Kock with another veteran looming on the bench in the form of ex-All Black Justin Marshall. "I think De Kock and Marshall bring international class," added Bracken on the challenge facing Youngs. "They are tried and tested, extremely talented and have had very good seasons themselves. I think these days it's hard to compare scrum-halves as there are not really one-on-one battles anymore. De Kock is very quick, a great box kicker and has good all round skills and maybe he would have the edge on Youngs there. But Youngs has the ability to create a break and change a game which is a huge advantage. Those two are going to be playing a chess battle or sorts but I think it will be a case of a clash of titans up front and that's where it will be decided."